This text explores the customs and ceremonies of the different tribes - their sacred dances, mythical kachina dolls and ornate clothes. Provides an overview of the past and present lives of the Pequot Native Americans, covering their daily life, customs, and government. Includes information on the Pequot War. Apache, Pueblo, Iroquois, and Navajo. We are Wampanoags, People of the Breaking Day. A story of the Wampanoag people. 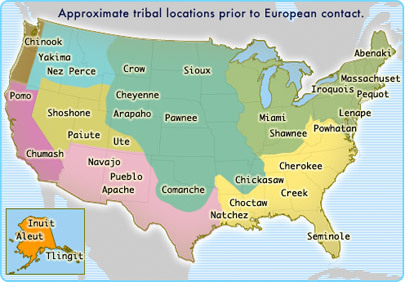 Identify where the tribes are located in North America. Type the tribe name in the box. Find quick facts about Iroquois, Cherokee, Sioux, Navaho, Chinook, and Lenape Indians.